Born in New York City on 24 April 1906, William Joyce moved to Galway in southern Ireland with his family in November 1909. He spent so much time with the Black and Tans and supposedly informed on a priest who was killed by them that the IRA reputedly ordered his assassination. On 8 December 1921 he escaped to England. He developed an interest in fascism and on 22 October 1924, while working as a steward at a Conservative Party meeting at Battersea, he was slashed across the face, leaving a large scar on his right cheek. On 6 July 1933 he lied on an application for a passport claiming that he had been born in Galway. It was a deception that would end on the gallows. 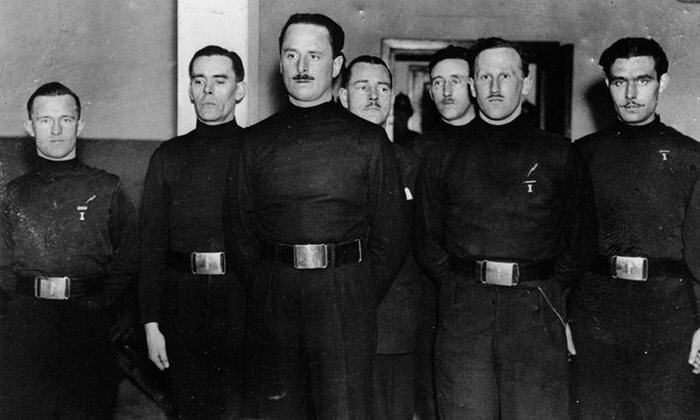 On 17 August 1933 Joyce joined the British Union of Fascists and rose to become deputy to Sir Oswald Mosley. On 11 March 1937 the movement made him redundant to save costs after membership fell. Joyce founded his own organization whose aim was to prevent war with Germany. On 27 August 1939 Joyce and his second wife arrived in the Fatherland. On 6 September 1939 he made his first, albeit anonymous, broadcast on German radio. Joyce soon became the best known of the treacherous broadcasters nicknamed Lord Haw-Haw. Lord Haw-Haw was the name given to several announcers on the Engligh-language programme broadcast by Nazi German radio to British and American audiences. On 28 May 1945 Joyce and his wife were captured at Flensburg on the Danish—German border by a British naturalized German—Jewish soldier. Joyce’s trial began at the Old Bailey on 17 September 1945. Joyce denied treason and, in truth, the British knew that being an American-born German citizen, he could not be guilty. At 3.37pm on 19 September 1945 the judge instructed the jury to find Joyce guilty, which they did at 4pm. Sentenced to death, Joyce was hanged by Albert Pierrepoint at Wandsworth Prison at 9pm on 3 January 1946. He was 39.